Math: Question 1 p. 70 (mid-chapter review) to be solved in the homework notebook. Science test on Friday Dec. 5th, the test will cover habitats and communities unit. Students can review from the habitats package and the science textbook. Mashallah we have finished memorizing Surat Al-Insan this week, while applying the tajweed rules and understanding the new vocabulary in the Surah. Inshallah your child will have a test in the whole Surah on Wednesday December 3, 2014. Please help your child practice for the test, there will be a rubric sent back with him/her after the test with their mark inshallah. Attached is the new Vocabulary sheet. Here is a clarification of what is expected for the poster of the Cordillera region. Students needs to make a poster about the jobs that are prominent in the Cordillera region. 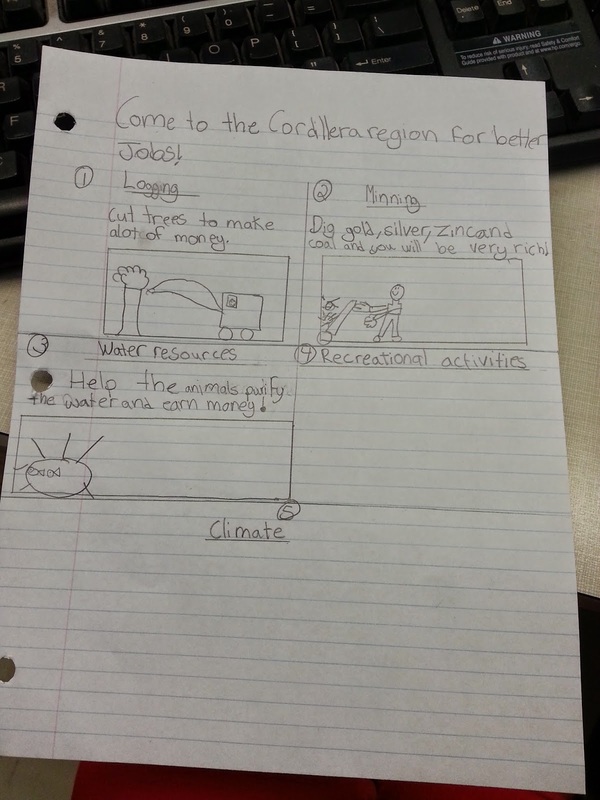 They need to focus on the ones we read about in class (logging, mining, water resources, recreational activities) and explain about the three climate zones. They were also given the good copy paper (white paper) in class therefore they do not need to get their own. 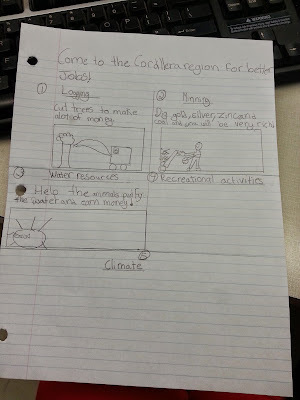 Here is a picture of a rough draft that a student was working on in class. We have finished reading about the Cordillera region and inshAllah we will be having test on it next Wednesday November 19th, 2014. The test will consists of short answers. Students were also given a review on what to study. Students are also working on creating a poster where they are explaining to someone who needs a job to move to the Cordillera region. The poster must consist of the physical features and resources in the area that help creates jobs. If you have any questions please email me. The poster is due on Wednesday November 19th, 2014 as well. Tomorrow we will be starting Health. I need students to bring in flyers (Metro, Food Basics, Freshco etc.) for an assignment they will be doing. Thank-You.